Elastic resistance has long proven to be a safe approach to training, and the Flexistretcher stretching aid brings this powerful method to the world of dance. Use the Flexistretcher to simulate dance-specific movement patterns, focusing on improvements in execution and mobility. The variable resistance nature of the band increases the tension through the stretch, requiring the muscles to work harder, which in turn promotes their growth and strength. 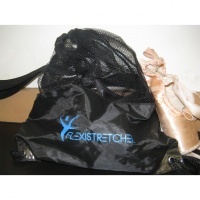 The Flexistretcher is lightweight and portable, but durable to withstand daily usage. An instructional pamphlet is included.